If your cat insists on waking you up at 4 a.m. every day it’s probably because they tricked you at some point in the past and then kept tricking you because you were so easily tricked. Congratulations, you have been outsmarted by an animal that comes up to your shins and poops in a box in the corner. The good news is that you’re not alone. Cats are wily creatures who are excellent at training their people to do what they want; e.g., annoying them in the morning for food and attention. The better news is that you can recondition your cat to stop waking you up before the sun rises or raising hell at night while you’re trying to sleep. The most likely reason that your cat wakes you up in the morning is food, specifically one of two things related to food. Let’s focus on the latter. There’s a good chance that at some point your cat pounced on you in the morning, pawed at your face, or started knocking things off your shelves. There’s an equally good chance that you gave them food to shut them up so you could go back to sleep. There’s an absolute certainty that your cat noticed this connection and banked the information for later use. What this all amounts to is your cat playing you like a fiddle. Your cat was hoping to get a reaction from you, and they got it. Actually, they might not have wanted food the first few times — maybe they were bored and wanted to play — but when they realized that annoying you resulted in food, they discovered a new way to score a morning snack. The same goes for a hungry cat. If they think 4 a.m. is a good time for breakfast, they have no reason to think differently if you relent and feed them when they meow, bat items off shelves, and otherwise annoy the crap out of you. It will take a little patience and a few special tools, but you can recondition your cat to stop annoying you when you’re sleeping. In other words, you can’t ignore your cat and hope they’ll go away. This doesn’t mean you should cave and reward your cat’s bad behavior with food or attention, but you can’t expect them to stop waking you up unless you give them another outlet for their attention. If you’re going to train your cat to wake up later in the morning — or at least not wake you up before the sun rises — you’ll need a way to reward them with food, but in a way that doesn’t involve you getting out of bed, which will only reinforce the bad behavior. This is where an automatic feeder comes in. Using the automatic feeder, you can slowly recondition your cat to expect meals later in the morning. Start Early: Set the feeder to distribute food slightly earlier than the time your cat normally wakes you up. This way they won’t get a chance to act out the behavior that previously got them a reward; i.e., annoy you to get fed. Feed Later: After a few days, set the feeder to go off a few minutes later. Then set the feeder’s time later and later every few days. If your cat starts to bug you in the morning again, set the timer slightly earlier for a day or two, then go back to the later times. Eventually, your cat will expect food later and later in the morning (cats are creatures of routine and have fairly reliable internal clocks) and they won’t feel the need to get you out of bed. When selecting a feeder, you’ll want one that’s easy to clean, reliable, and (ideally) can distribute wet food as well as dry food. (Dry food has less moisture than wet food and can increase a cat’s risk of bladder inflammation, stones, constipation, and urinary obstruction.) It’s not absolutely necessary that you pick up a wet-food automatic feeder, but it can be better in the long run. Alternatively, you can use the automatic feeder to give your cat dry food in the morning, then feed them wet food by hand (i.e., not from the auto feeder) for their remaining meals. With that being said, here are some of our favorite automatic feeders. If, in spite of your reconditioning training, your cat is still waking you up and seems constantly hungry, there might be an underlying medical condition. Diabetes, hyperthyroidism, and other medical problems can cause voracious appetites in cats. So if your training doesn’t seem to have much effect on your cat’s early-morning wake-ups, your vet can help to get to the bottom of things. If your cat is waking you up because they’re hungry, then you should be able to readjust their morning mealtime using an automatic feeder (as described above). But if the real issue is that they’re bored, restless, or just generally active at night, you need to provide alternative forms of entertainment. Food Puzzles: Stash food puzzles around the house so your cat can entertain themselves by “hunting” at night. The best thing about a food puzzle is your cat will have an additional form of entertainment once they’ve sniffed out their "prey." Toys: Stash you cat’s favorite toys around the house. Of course, they’ll have to be toys your cat can play with alone. Try using stuffed catnip toys, which have a small Velcro pouch where you can load up catnip to encourage play. Furry Friend: If your cat is an only child, you might consider bringing in a new animal buddy to play with them. To prevent an annoying cat from terrorizing you in the morning, you need to put them back in their normal cycle. For a cat, that cycle is hunt, groom, sleep. Dr. Koski recommends the following to get the most out of playtime so your cat will sleep through the night. Have play time, aka a “hunting session,” right before bed time. Take your cat through the “prey sequence” to make the hunt feel real. Your cat should do all of the following, in relation to their toy. Take them through the prey sequence several times. After they’ve had their hunt and captured their prey, give a high-protein meal so your cat feels like they’ve had a successful hunt. One great toy option is Da Bird, a cat wand that has a variety of interchangeable “lures.” No two cats are the same so you can’t expect that your cat will want to hunt/play with any toy you present to them. Da Bird is helpful because you can swap out lures to find what your cat is most interested in “hunting,” using different lures like feathers, toy mice, insects, and others. Try experimenting with the lures until you find one that’s best for your particular cat. The more they like the toy, the more they’ll feel like they’ve hunted something, and the less they’ll feel the need to annoy you. Should You Ignore Your Cat or Lock Them Out of the Room at Night? This is a little tricky. You shouldn’t just ignore your cat, but you shouldn’t not ignore your cat either. Shutting the door and locking your kitty out of the bedroom might work, though they will probably protest for a few nights by yowling outside the door or scratching at it. But shutting the door won’t reduce their boredom. You can shut the door, but be sure that you’ve provided your cat with alternative forms of entertainment, like those mentioned above. You can also try placing blackout curtains on your windows (not just in the bedroom, but throughout your home). Using blackout curtains can prevent your cat from seeing the sunrise and therefore prevent them from thinking it’s time food or play. However, just like shutting the door and ignoring your cat, curtains alone won’t solve the problem. 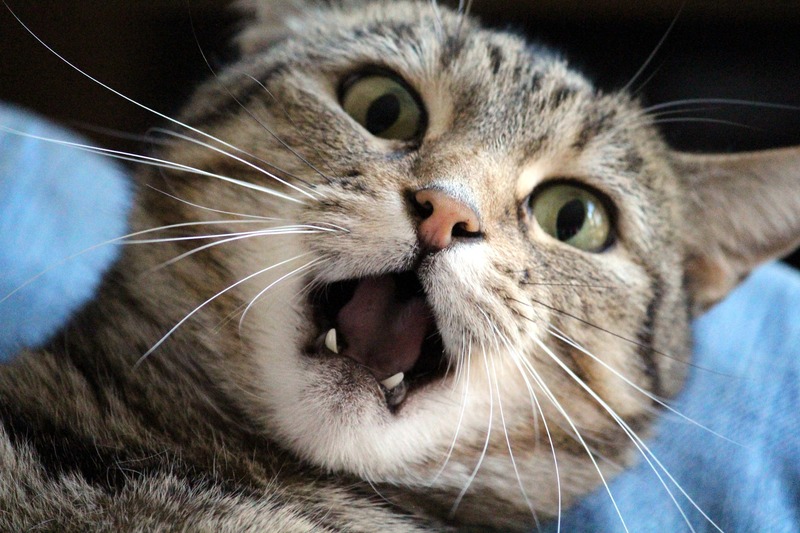 Cat Yowling at Night: Should You Be Concerned? There’s a difference between a cat that’s trying to wake you up in the morning and a cat that’s restless and yowling at night. It could still be a behavioral issue, but there might be an underlying medical cause. 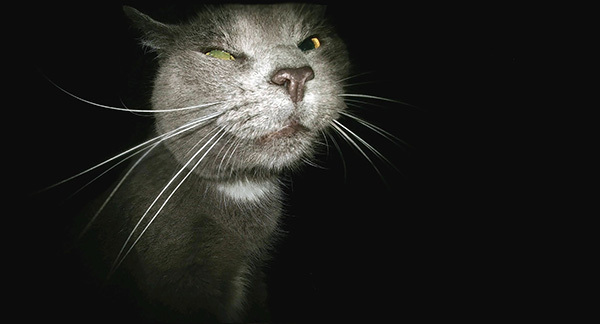 Here are some of the most common reasons that a cat might yowl at night. Old Age: Yowling in older cats might be due to Feline Cognitive Dysfunction Syndrome, otherwise known as feline dementia. Boredom: An indoor cat that doesn’t get much opportunity for exercise or play might yowl excessively because they’re bored. Stress: Sudden changes in a cat’s routine — like the addition of a new baby or a recent move — can stress out a cat and cause them to vocalize. Medical Problems: If you can rule out the other causes of your cat’s yowling, then it’s time for a trip to the vet. And if your cat is vocalizing while using the litter box, get them to the vet immediately! This could be a sign of a potentially fatal urinary obstruction.